The Volkswagen Group aims by 2030 to have electrified (EV) versions of all 300 models sold around the world, says its CEO Matthias Mueller. 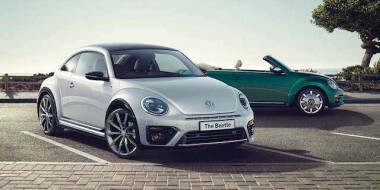 And by 2025, the VW brand alone is targeting 33 per cent of the planned three million sales of EVs from the wider VW Group – Audi, Porsche, Skoda, Seat, Bentley, Lamborghini. The move to more EVs has been given new impetus by the so-called dieselgate scandal. 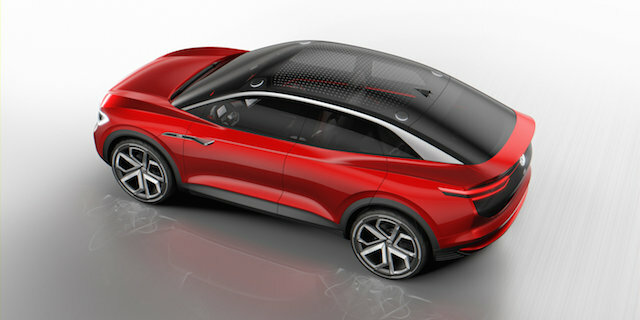 “We’re sending clear signals to suppliers, politicians, and customers – VW is going to lead the way to the future,” said Mueller, speaking at the Frankfurt motor show preview of the updated I.D.Crozz electric crossover concept, which goes into production in 2020. 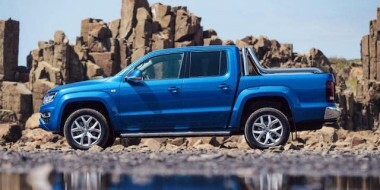 VW showed the first concept at the Shanghai show earlier this year. “A (EV) breakthrough won’t be achieved by self-proclaimed pioneers, but those who put the tech on the road in relevant numbers… a group that sells 10 million cars every year in all segments and all regions,” Mueller said. “2030 is basically the day after tomorrow, which means we are going to pick up the pace. With our road map we are going to redefine our priorities. “Electro-mobility is still in its infancy, there are many unanswered questions about raw materials, infrastructure and battery recycling… for us the former and latter are inseparable, and creating infrastructures will be critical to success. “That’s what it’s all about. It’s a joint effort and everyone needs to make their contribution – the energy industry, auto industry and politicians. 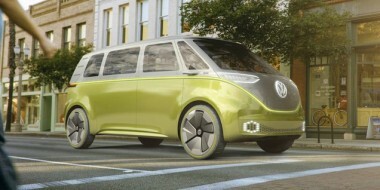 The I.D.Crozz II will go into production at the same time as the Golf-sized I.D.EV, roughly two years before the I.D.Buzz zero-emission van, the modern take on the Kombi (all three pictured at top). 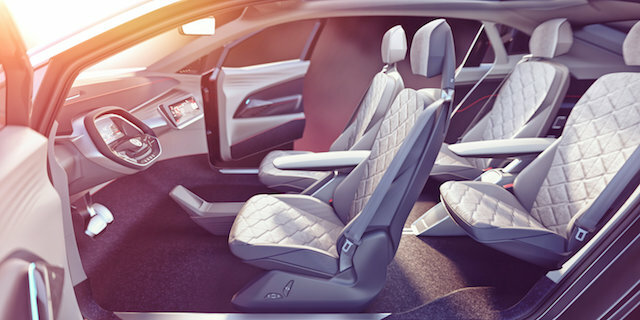 The EV crossover is slightly longer than the current Tiguan SUV and is based on the VW Group’s MEB architecture (modular electrification toolkit), a flexible platform for its future EVs. Power output from the lithium-ion battery pack is a claimed 225kW, with a range of 500km. 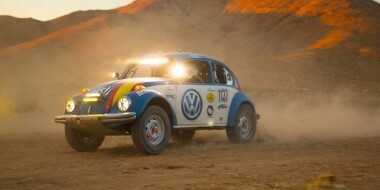 A fast-charging DC outlet will charge the pack to 80 per cent within 30 minutes, says VW. It also says, rather boldly, that I.D.Crozz II will have the “handling properties on the same level as a Golf GTI.” Why? Because weight is distributed 48 per cent front and 52 per cent rear, thanks to the central location of the battery pack and electric motors front and rear. A 150kW motor drives the rear axle and a 75kW coaxial drive the front. I.D Crozz II has an electric 4Motion all-wheel-drive system with an ‘electric propshaft’ distributing torque between front and rear axles. It can be locked for off-road conditions. I.D.Crozz II gets a new voice interaction system, activated by saying “Hello I.D.” and adding a command. It can also control the fully autonomous laser-guided ‘I.D. Pilot’ driving mode. In the middle of the instrument panel is a 10.2-inch tablet, an infotainment system that can be set up to suit the driver. There are four different functions – ‘Messages’, ‘Media’, ‘Telephone’ and ‘Navigation’. An ‘e-Mirror’ replaces the rear-view mirror. It merges data from three external cameras, mounted in the left and right-hand sides of the car and at the rear, and transmits them to the driver.